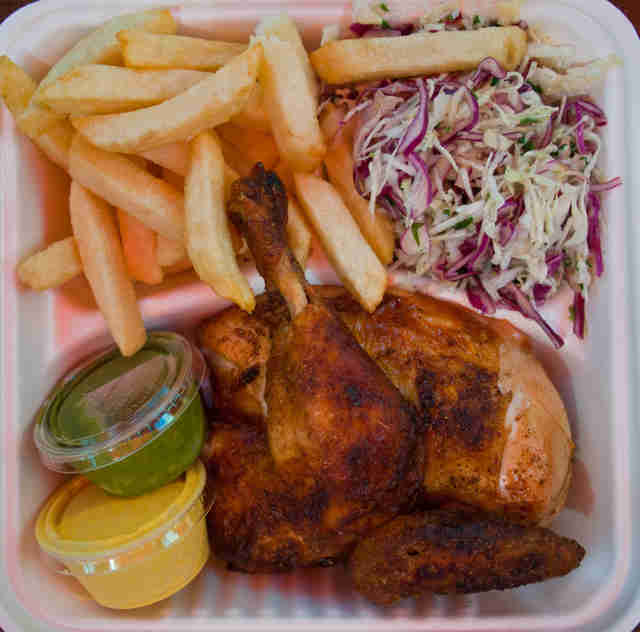 Pollo a la Brasa is the embodiment of Los Angeles’ melting-pot culture. In the heart of Koreatown, the eight-seat eatery’s Chinese owners, fluent in Spanish, serve up wood-fired chicken marinated in Peruvian spices and herbs, straight off the spit. Your falling-off-the-bone meat comes with two sides of your choice (trust us on the salad and rice tip), and all the spicy green ají sauce you can eat, for only $9. YES. The long-standing Brentwood spot, famous for its house-made chocolatey mole, has a massive menu featuring the latter sauce on everything from burritos to tacos, enchiladas, grilled meats, and the Oaxacan specialty, tlayuda, which is like a Mexican pizza using mole instead of tomato sauce. But getting the most for your money involves banana leaf-wrapped chicken-and-mole tamales. Slow-cooked chicken and rich mole in a soft corn shell that is steamed to perfection: at $4 each, grab two(!) and a fork, and dig in. 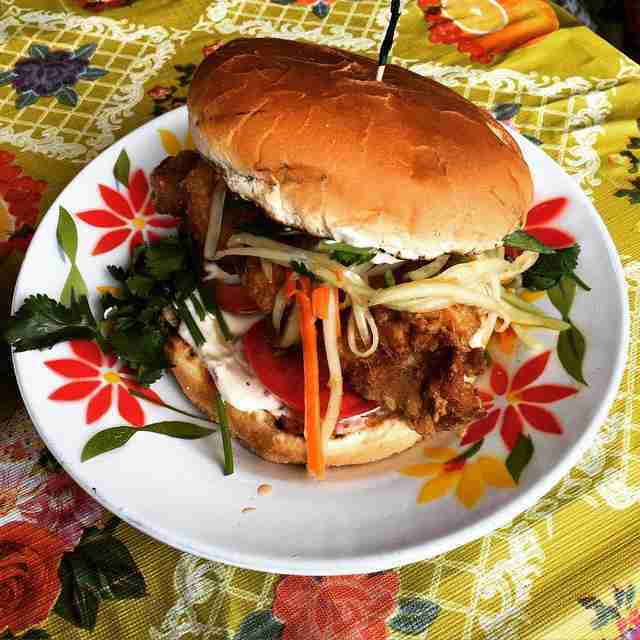 Arguably one of the best Thai restaurants in Los Angeles, Night + Market Song has a not-so-secret sandwich featuring its Chiengrai-style fried chicken thighs. The meat is crunchy and dripping with flavor, and topped with a slew of accoutrements including papaya slaw, julienned jalapeño, cilantro, tomato, and un-Thai-but-very-delicious ranch dressing. All on a sesame seed bun. Yes, this is the end-all, be-all of fried chicken sandwiches. And the whole mess is only $9. You couldn’t win any more if you tried. If you’re going to choose a heartier filling than just cheese for your quesadilla, it’s most likely going to be chicken or beef. At Mexicali Taco & Co., the house special, the "Vampiro," hooks you up with both, and there's also a chorizo option. The dish is so good that it’s one of the few places where ordering chicken won’t have you staring longingly at meatier plates on nearby tables. Grilled pollo and gooey cheese are doused with a garlicky sauce and then stuffed in a thick flour tortilla. Then they crisp it up on the griddle just before serving. Grab two for $9. Boom. 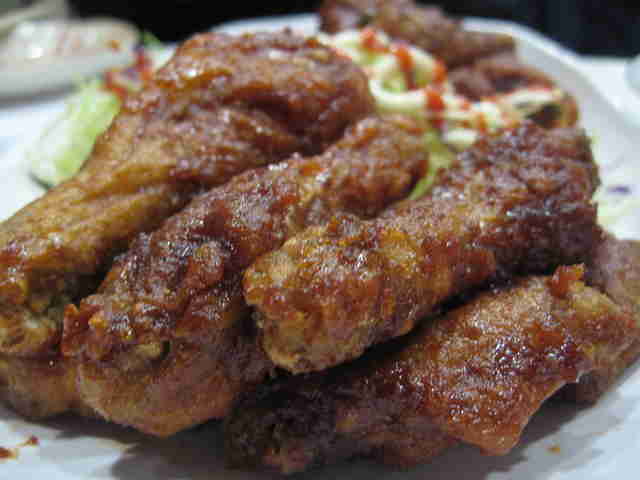 Korean fried chicken is a beautiful thing when done right. And at KyoChon Chicken, they know how to do it up proper. Just about everything on KyoChon’s menu is under $10, so you have plenty of budget-friendly options. But the one you want is the wings combo. The meal comes with half orders of sticky soy-garlic wings and extra-spicy hot-and-sweet wings. You get 10 wings, all plump and bursting with flavor, a side of potato wedges, and a drink (and a glove!) for $8.99. An order of the puffed rice-and-panko Sal Sal strips for $8.99 is always a win, too. 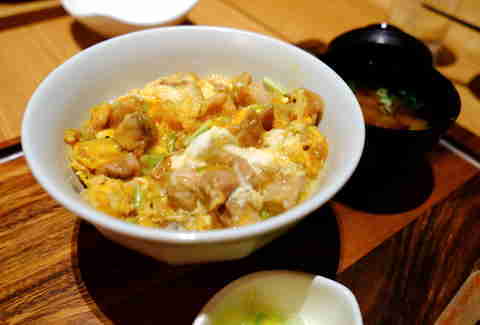 The giant Japanese bowl of steaming tastiness called oyakodon is one of the best versions of chicken and rice you’ll ever have. The version at Suehiro Cafe in Little Tokyo takes seasoned, slightly sweet rice and tops it with marinated dark meat chicken, over-medium egg, sautéed onions, and a sweet soy sauce. The beauty is that the sauce is mixed into the rice in advance, insuring every bite is both sweet and flavorful. This filling meal comes with a cup of miso soup and lots of joy for $7.25. FWIW, the shop also serves a salty katsu version with plenty of crunch for only $8. Go with a friend. Known for its signature spice-heavy jerk chicken, Cha Cha Chicken also serves a tender coconut chicken that will drive your taste buds wild. Three hefty chunks of white meat chicken are dipped in sticky coconut batter and deep-fried until golden, then served piping hot. Throw in sides of the dirty rice and sweet plantains, and you’ve got yourself a serious meal for just $9.95. 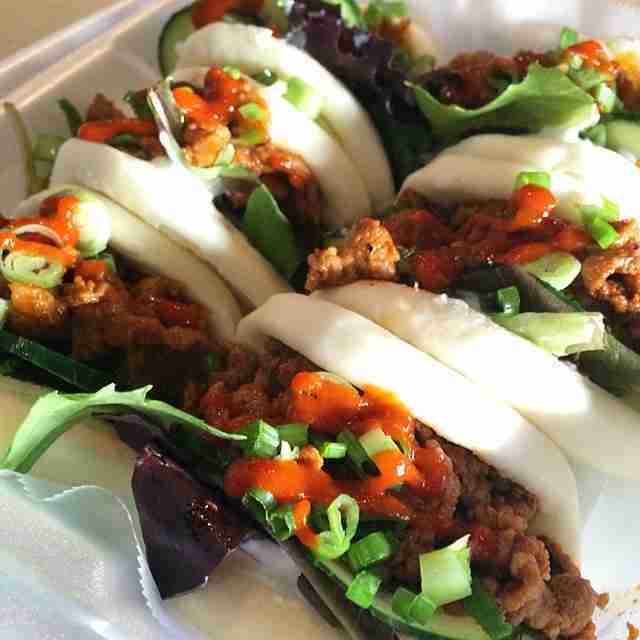 Loyal fans flock to The Bun Shop for its fluffy bao buns filled with pork belly, Spam, or kalbi beef. All are exceptional, but the overstuffed chicken katsu is the bun of the K-town ball. The traditional takeout treat is layered with sweet barbecue sauce and crunchy slaw, and wrapped in a light-as-air steamed bun. And the chicken... mouth-drop emoji. The panko-crusted filet is fried to a dark brown, adding to the mini sandwich’s cool, crispy, and saucy all-in-one bite. At $3 each, the Japanese comfort food is a solid meal for under 10 bucks. Smack in the center of the Watts food desert lies the newly christened Mexican-American fast-food spot, LocoL. We’ve told you a ton about the place, but here’s more about the food: the celebrity chefs behind the joint, Roy Choi and Daniel Patterson, have created a place where spicy kogi beef burgers and fries topped with chili and crackers come together in perfect harmony. What’s even more harmonious is the fried chicken burger for $4. A filet of brined white meat chicken is breaded and fried until crisp, then topped with buttermilk mayo, hot sauce, and crunchy slaw. The burger gets that much better with a bun created by the chef of San Francisco’s famed Tartine Bakery. Once assembled, the sandwich is crusted up on the griddle. Bravo. 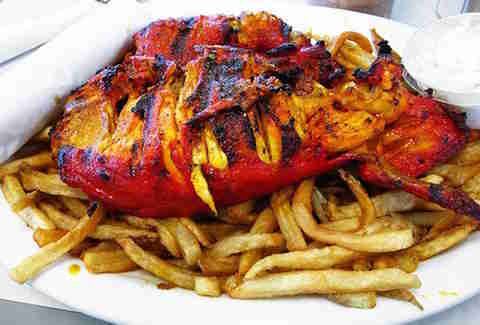 The famous chicken outpost has been around for over 40 years, using the same family recipe to cook up some of the best chicken the city has to offer -- a recipe so good, we called it one of the 50 dishes you have to eat in LA before you die. Owner Dino Pantazis’ marinated and grilled birds are smeared with a thick layer of spicy red sauce made with garlic, schmaltz, and plenty of vinegar. 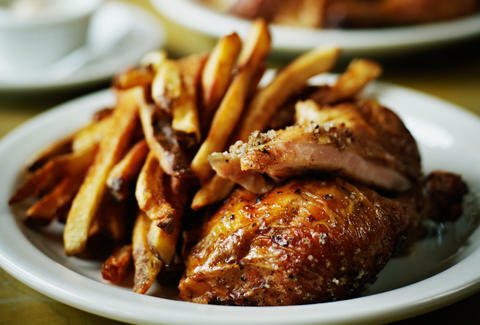 You’ll want to savor bite after bite of your half-chicken order, which also comes with a huge mound of fries (or beans and rice), creamy coleslaw, and fresh tortillas (and always -- ALWAYS -- ask for extra sauce), all at the staggering price of $7.25. Don’t ask us how, just go. Kalgooksoo is Korea’s chicken soup for the soul, and your belly. Hangari Bajirak Kalgooksoo's $9.95 version is brimming with aromatic broth, and is seasoned with spices like ground red pepper and whole dried jujube dates. The soup is rich with quality ingredients, including a whole chicken, scallions, and shredded nori. Thick slices of pumpkin bob around white onions and the restaurant’s famous knife-cut noodles. It’s the perfect meal for those chilly winter days when the temperature drops... below 70. 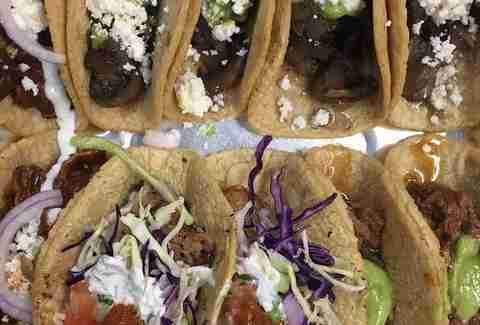 It’s hard to not want to order plates of Guisados’ cochinita pibil and chicharron tacos. But if you’re feeling less porky than usual, the tinga chicken tacos (from any of its locations, including the newest one in West Hollywood) are where it’s at. The restaurant starts with shredded chicken that’s been braised with tomatoes and cabbage, chunks of chorizo, and chipotle peppers. It cooks the meat for hours and then serves it on top of freshly made corn tortillas. 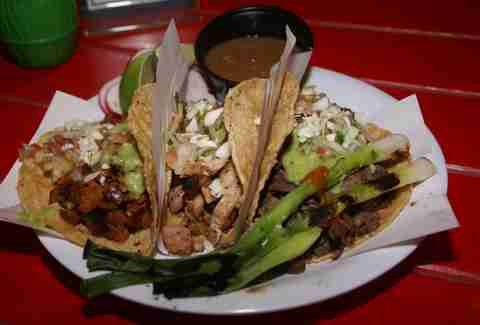 The $2.75-each tacos come with slices of avocado and more chipotle chile sauce. If that’s not enough spice, there's also a legit salsa bar featuring a fluorescent-orange habanero sauce and a tangy tomatillo salsa. Andriana Albert is a freelance writer who met her boyfriend during a late-night run to Roscoe’s House of Chicken and Waffles. Her life has never been the same. Follow her on Twitter: @itsadredogg.